Getting Back to Routine, Without Needing Therapy! January is not the only time that people start working out and setting goals. Did you know that September is the biggest month for getting back into a routine, trying to get healthy and when most sports start? This is great news because it’s upon us right now. Whether you are getting back into working out or playing a sport, there is an increase in activity. But, have you been exercising or training all summer? Overuse injuries creep up on us. They are not like a sprained ankle from tripping over a curb. They have no exact date to which you can say when it started to hurt. They seem to just appear! This time of year people are in clinics across town with overuse injuries, from getting back into the swing of things. Overuse injuries can happen from starting too much exercise too soon, or from increasing the frequency or intensity before you’re ready. Unfortunately, you can’t cram fitness or reach a goal overnight. It takes a gradual progression and listening to your body. 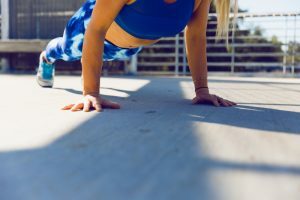 If you have only had some time off and know the exercises, like starting to lift weights again, or starting practices again, you don’t need to start at the beginning. But remember that the body will lose muscle when it’s in disuse. You need to get that back. Start small, less weight, more recovery time. Then gradually increase each week. The general, conservative rule, is increasing frequency, intensity, and time by ten percent per week. If you are new to the exercise or sport, you need a phase of learning. Start carefully and learn what you need to do. Then start increasing. You should feel confident and ready to increase. Your form should be spot on before increasing, your skills should be mastered before learning more. It may seem like small progress in the beginning but once you really get going, you’ll improve in leaps and bounds. Don’t forget to recover. When starting or getting back into your exercise or sport, you must make sure you have good self-care. This includes a proper warm up, a cool down, stretching, eating right after your workout, drinking 2-3L of water daily, and sleeping more. It’s not fun being injured. And if you just start exercising at a level that is too high than your body is used to, you will not recover, and eventually get injured. It sounds funny for an athletic therapist to promote prevention, but hey, education is a big part of my job. So get out there and enjoy your exercise. Get back to your sport. Meet your goals this September! But doing it smart, and take time to do it right. By Jen Mark, RKIN, CAT(C), CSCS. Jen is a registered Kinesiologist and Athletic Therapist at Body Design. Body Design offers Personal Training, Athletic Therapy, Nutrition, Yoga and Group Fitness Classes to assist individuals achieve their fitness and health goals. « The Organic Debate: Is Eating Organic Food Really Better?